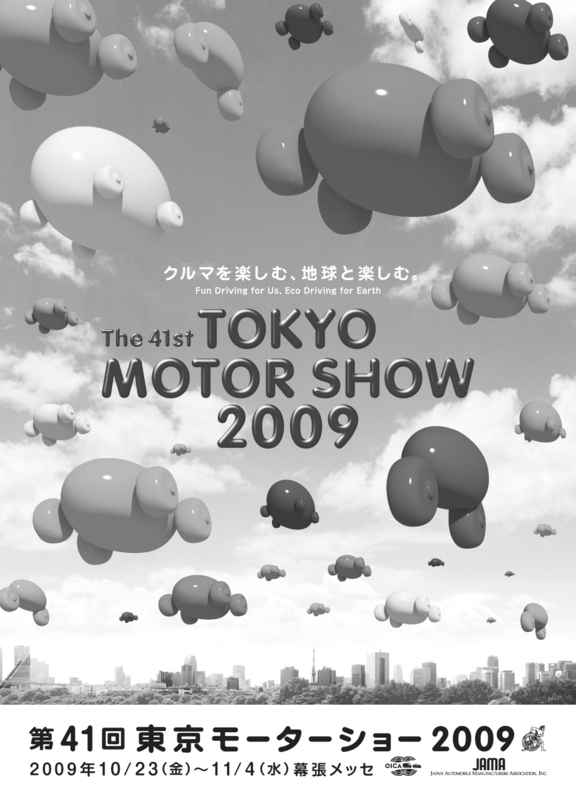 The Japan Automobile Manufacturers Association, Inc. (Chairman: Satoshi Aoki) is pleased to announce the show theme and poster design for the 41st Tokyo Motor Show 2009. The show will be held at Makuhari Messe, Chiba city for a total of 17 days from Friday, October 23 through Sunday, November 8, 2009 (open to public from Saturday, October 24). The poster design incorporates the two ideas of "Fun" and "Eco" in the "balloon car" symbol. The balloon cars were formed to evoke passenger cars, commercial vehicles and motorcycles, embodying the idea of a "comprehensive show." The cute, round shapes represent fun while their colorful bodies derive from a rainbow, symbolizing harmony with nature. As the poster visualizes these balloon cars flying over the Tokyo sky, it expresses the future cars progressing and evolving with both such "Fun" and "Eco".